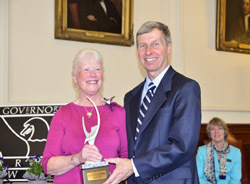 On April 27, 2011, the Governors Arts Awards recipients were announced by Governor John Lynch at a State House ceremony and reception at Red River Theatres, hosted by the New Hampshire State Council on the Arts. 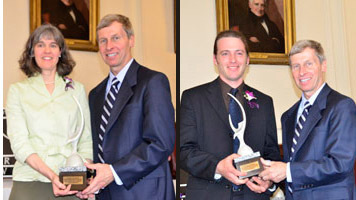 The Arts Council received 18 nominations for the 2011 Governors Arts Awards. 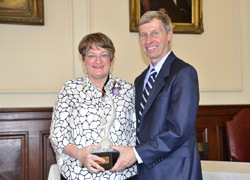 Recipients in five categories were designated to receive 2011 Governors Arts Awards. The awards are typically presented every two years. 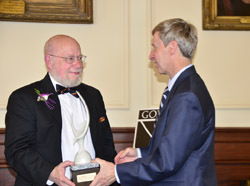 The 2011 Governors Arts Awards recognize outstanding accomplishments in arts education, arts patronage, distinguished arts leadership, folk heritage, and individual artist’s lifetime of work. Each recipient received an award created by artist Andre Belanger of Berlin, NH. 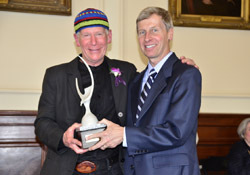 He was commissioned to create the award based on the eagle atop the State House dome. The artist commissioned to create this year's award was selected through a Request for Proposals process. 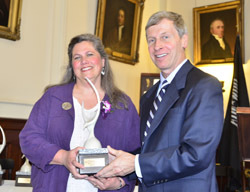 The award interprets the eagle designed for the dome of the State House. The sculpture, installed in 1819, was the first commissioned public work of art in the state’s history. Since the 1950s, the wooden original has been safely preserved by the New Hampshire Historical Society at the Tuck Library in Concord and is on display in the building’s rotunda. 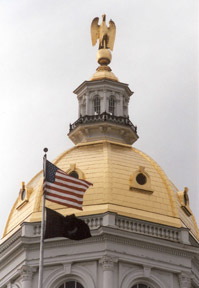 Its gold-leafed replica currently stands atop the State House dome.